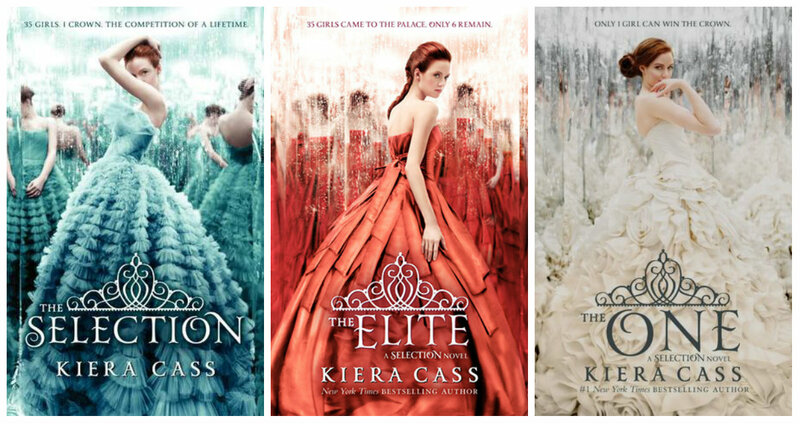 Beautiful dresses on the covers, promises of sweeping romances against a background of a class system – The Selection Trilogy had me hooked from the covers alone! The One – all by Kiera Cass. The Selection is, essentially, The Bachelor, set against a backdrop of a royal kingdom in a dystopian future America (now called Illéa) (ha, funny, the main character is named America), where thirty-five girls compete to win the hand of the Prince, Maxon, and thus become the future queen of Illéa. From reading the blurbs, it’s easy to see what this book will be about – a love triangle between America, Aspen, and Maxon, where America will slowly realise that the Selection she entered for reasons of… whatever they were, I can’t remember, was the best decision she ever made (although she’ll agonise and teeter between the two men for THREE WHOLE BOOKS), combined with fantastic descriptions of luxurious dresses, balls, parties, royal dealings, and a political plot, too. America, naturally, will turn out to be the prince’s favourite, although she won’t be suitable because of reasons of class and demeanour and, you know, being in love with Aspen. Yes, these books were predictable. Yes, it was obvious from the beginning who she was going to choose and how it was going to turn out. Did that lessen my enjoyment of them? No, not at all. I chewed through all three books in less than a week, and they followed close on the heels of Amanda Hocking’s Trylle trilogy – given that both are about suddenly being thrust into a royal palace and realising how corrupt one’s society is, they both kind of blended into one in my head. I have to admit, though, The Selection trilogy has more dresses, where The Trylle trilogy has more supernatural powers. Both good though. There’s nothing deep or meaningful about The Selection trilogy – the political machinations are just a backdrop to a love story. There’s nothing wrong with that, though, and I thoroughly enjoyed all three Selection books. They aren’t standout in their field, by any means, and I’ve heard that there are two new full-length novels a sequel about the next Selection called The Heir, and an as-yet untitled second sequel – this, to me, feels like pushing it a bit far. The original trilogy sits fine. The two published e-novellas and two forthcoming e-novellas, combined with the two more full-length novels feel like stretching the material much thinner than it can handle. As a trilogy on their own, though, a solid three stars for all three books.